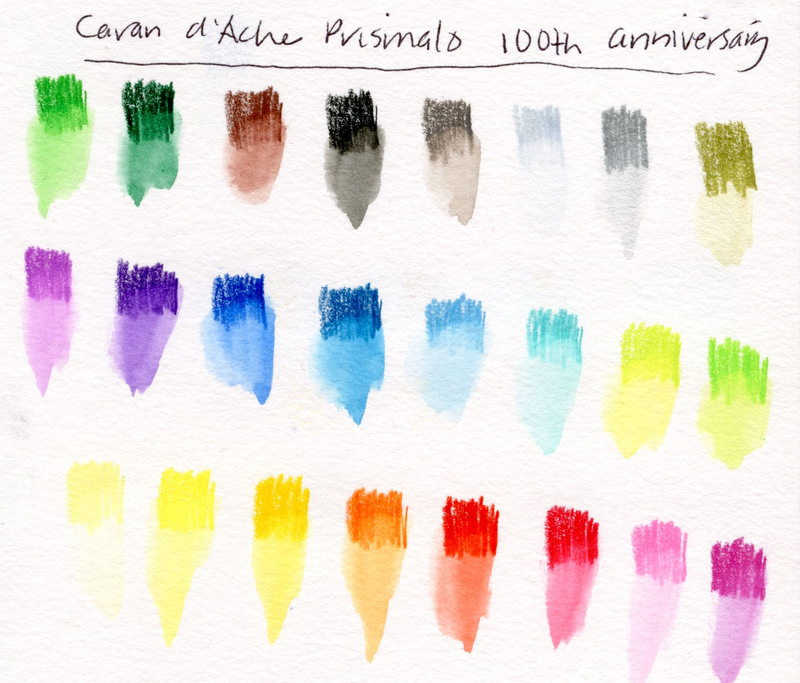 A while back I spotted Caran d’Ache’s 100th anniversary Prismalo colored pencils at CW Pencils. 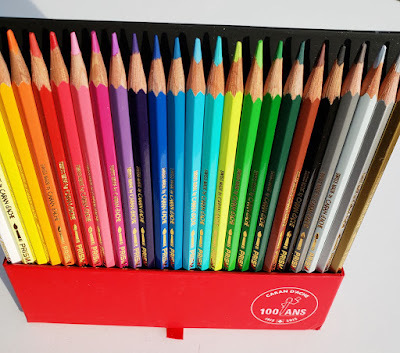 Unlike the Supracolor set of 30 new colors to celebrate that line’s 30th anniversary, the Prismalo set didn’t seem to have any new colors (nor even a special mark on the pencils), so I assumed it was just the packaging that was commemorative. I resisted a set that was obviously intended mainly for collecting rather than using. My interest, however, in Caran d’Ache’s product lines (especially water-soluble colored pencils, which the Swiss company invented and introduced with the Prismalo line in 1931) and their history continued to pique my curiosity about a few things. 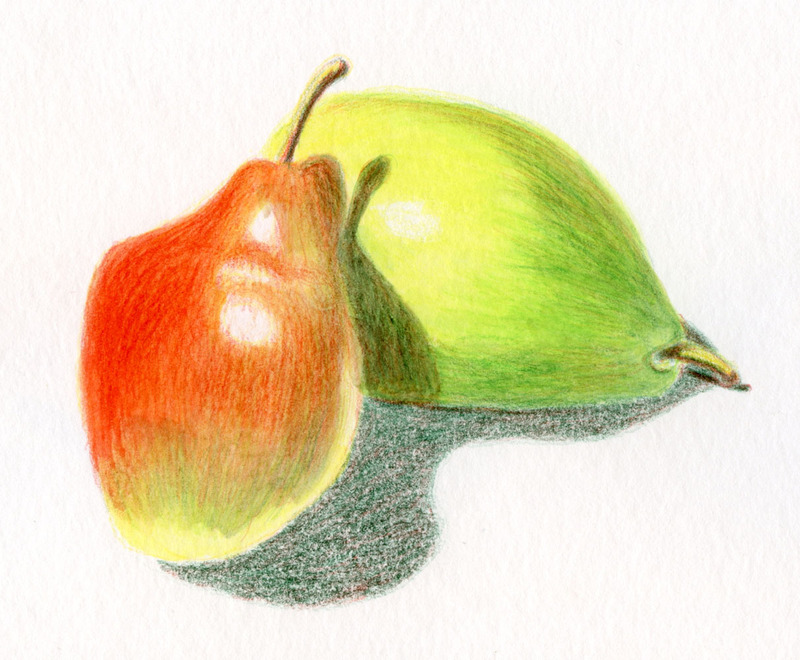 Earlier this year, I reviewed a vintage set of Prismalo pencils I found on eBay. 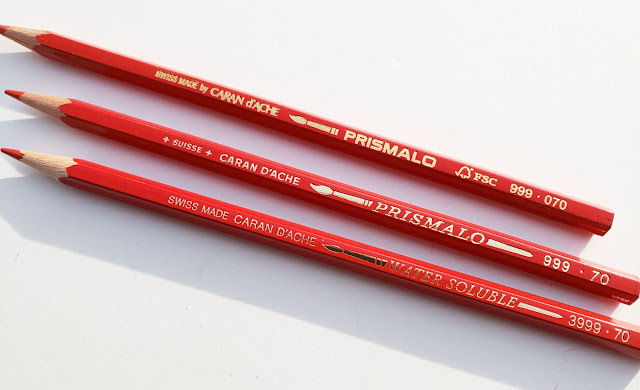 In that review, I was puzzled about where Prismalos stand, in terms of quality, in Caran d’Ache’s product family. I concluded that the vintage set I have seems to line up more closely with student-grade Fancolor than with artist-quality Supracolor (and certainly Prismalo comes nowhere near premium-quality Museum Aquarelle). For a while, I thought Prismalo was no longer available, which led me to speculate that the contemporary Fancolor product might have taken its place. 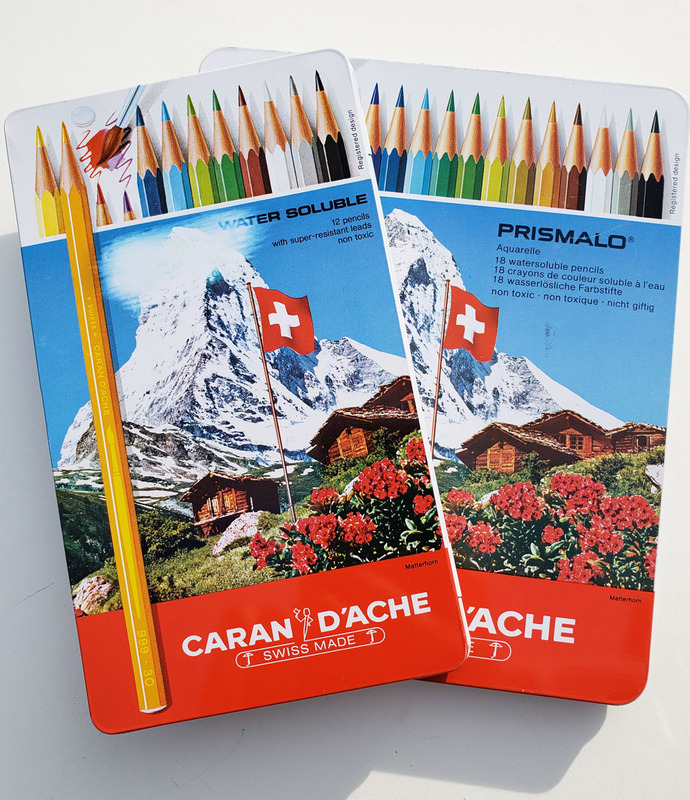 Later, though, readers and European colored pencil fans pointed out that Prismalo is still a current product (more easily found in Europe than in the US). "Prismalo" and the other is not. A few months after writing that review, I found another small box on eBay that looked identical to my vintage box of Prismalos – except that it had no mention of the name “Prismalo” – only the term “water soluble.” The eBay vendor’s description was even more intriguing: She claimed that this set contained Supracolor I watercolor pencils, “which are harder than Supracolor II.” What?! This certainly sparked my curiosity; I have wondered many times why the Supracolor line had started out with a Roman numeral II and was later called Supracolor II Soft and finally just Supracolor Soft – what happened to Supracolor I? Would this box on eBay finally resolve that mystery? Both vintage sets look similar, inside and out. The pencil bodies and tins look so similar that it’s hard to imagine that the Prismalos and the non-Prismalos are not the same product. Even the ages of my two sets look similar. Compared side by side in use, they are identical: Harder and less vibrant when water-activated than contemporary Supracolors, and all the hues (with matching color numbers) are identical. Was the water-soluble line later named “Prismalo”? But if so, why is Prismalo considered Caran d’Ache’s first water-soluble product? Another mystery! 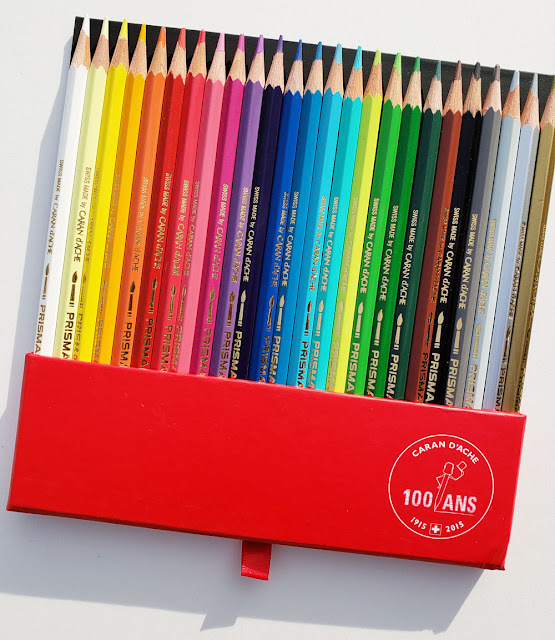 All these frustrations led me to the inevitable: I bought the 100th anniversary set of Prismalo pencils! 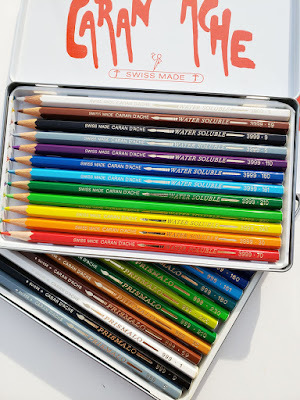 I didn’t really believe that owning the collectible set would resolve any questions, but I knew that they would make me happy (as nearly every colored pencil does). 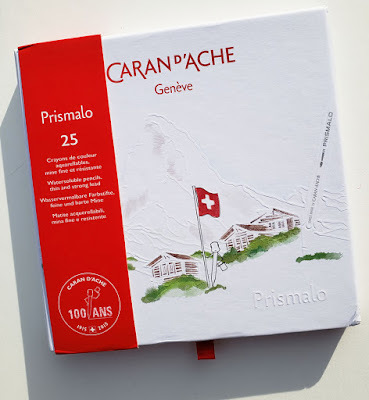 The lovely commemorative box (shown at top of post) includes an embossed portrait of the Matterhorn, the Prismalo line’s icon. The paper box (instead of a contemporary metal tin) has a vintage feeling (although sadly, my box got a bit crushed on one corner. Good thing I’m not a collector intending to keep this set in mint condition for future resale). Pulling the small red ribbon tab reveals the drawer of pencils. The 100th anniversary Prismalo pencils. A hinged kickstand behind the tray folds out, enabling the tray to stand on the desktop. 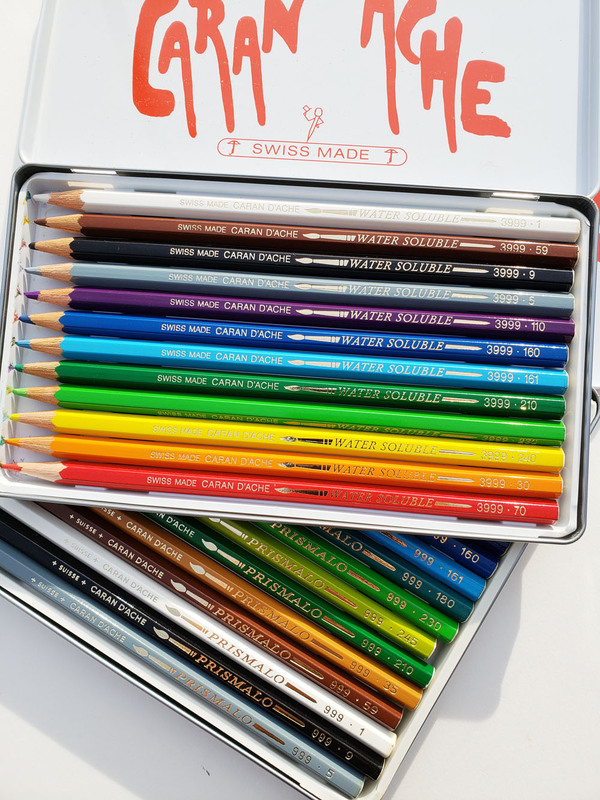 This, too, is a charming, nostalgic touch that reminds me of Mongol, Venus and other vintage colored pencils that came in boxes with stands. A hinged kickstand folds out. For historical interest, I lined up an anniversary edition Prismalo alongside a vintage one and a vintage non-Prismalo pencil that looks just like it. Though with minor changes in typeface and branding, they are clearly of the same general design. All three have a white end cap. 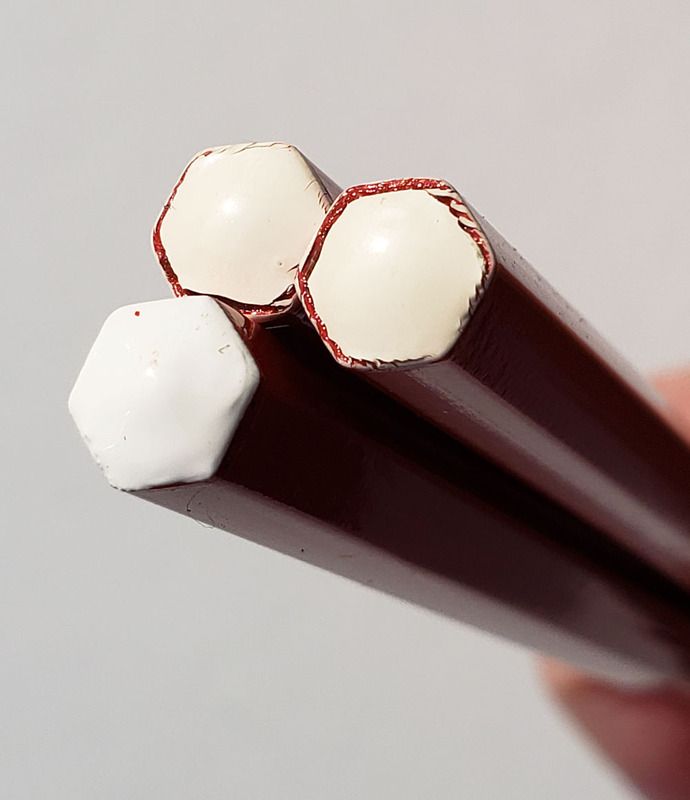 As I swatched the anniversary edition colors, I immediately noticed something different: The contemporary Prismalos felt softer than I remembered the vintage ones being. I pulled out the vintage sets to refresh my memory, and I was right. While the contemporary Prismalos are still harder than Supracolors, they are distinctly softer than their ancestors. The water-swipe test brought another surprise. The new Prismalos activated much more vibrantly than their vintage ancestors, indicating that they contain more pigment. In fact, I started wondering if they were closer to Supracolors. . . ? How would all four compare? Now things were getting interesting! Picking out three colors (230 – yellow green, 70 – scarlet, 160 – cobalt blue) that are included in all four sets, I compared water-activated swatches side by side. 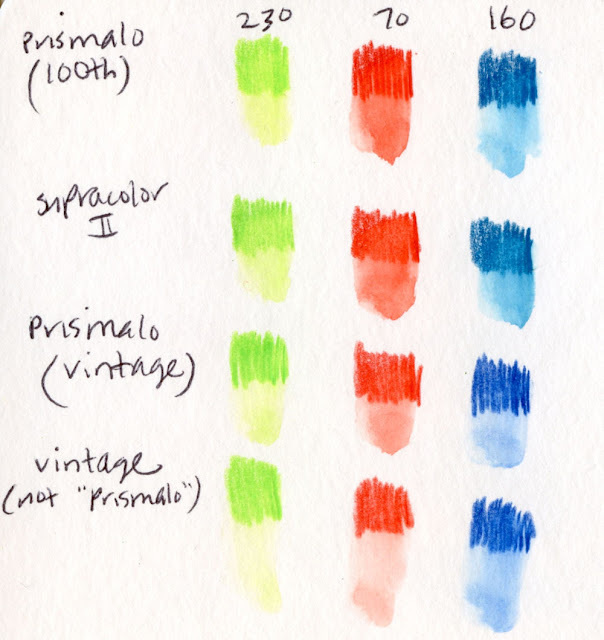 In softness, pigment quality and vibrancy when activated, I’d say the contemporary Prismalos are closer to Supracolors than to either of the vintage sets. I came to the same conclusion that I have several times now when I’ve been able to pit a contemporary product against its ancestors: Art material production processes continue to evolve and improve over time, and in general, newer products are better than older ones. We live in good times with many terrific options. As always, I ended my product review process by making a sample sketch. (In the past, I’ve consistently used apples, but I’ve moved on to the more challenging shape of pears.) Using a Stillman & Birn Beta sketchbook, I initially applied a light layer of pigment and then activated it. After the paper was completely dry, I started applying the next layer – and the pigment was strangely difficult to apply. Although I knew I had not flattened the paper’s tooth (which can happen when too much pressure is applied with the initial layer), it almost felt that way – like the new pigment was simply skidding over a waxy surface instead of being captured by the paper’s tooth. It took significant effort to get the color down. As is my usual process, I activated this second layer, allowed it to dry, and then applied more pigment, intending it to be the final texture and detail layer that I would not activate. I wasn’t happy with the color intensity at this point, however, so I went through another cycle of pigment and activation before finishing. I didn’t remember having difficulty with the vintage Prismalos . . . I was a bit perplexed. This is when my moment of insight came: Years ago when I first started dabbling in watercolor pencils, I used an inexpensive set that resulted in experiences similar to this: pigment applied after an initial layer of activation felt like it would not apply easily over the activated area. 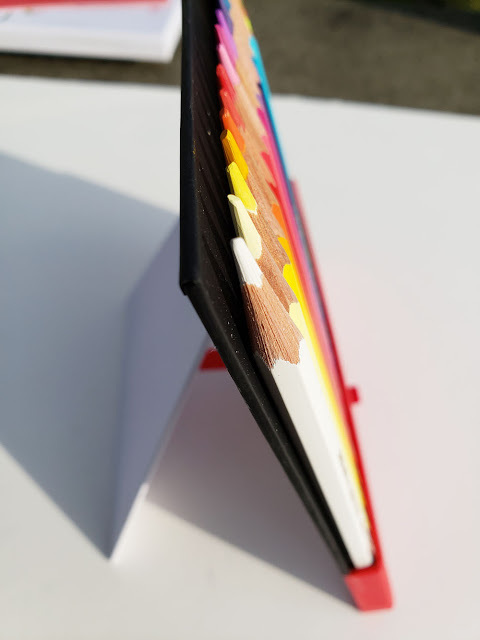 With my lack of experience or instruction (books I read at the time never seemed to address this), this experience led me to assume that dry pencil could not be reapplied after the previous layer had been activated. For years after, I always applied as much pigment as possible before activating it, thinking that once I applied water, I could not apply more. I often felt like I had taken an OK drawing of dry pencil and ruined it with water, but had no opportunity to fix it. I was frustrated regularly. When I finally studied watercolor pencils formally with Suzanne Brooker last year, I was so surprised to learn that not only can you continue applying more pigment over previously water-activated areas; it’s actually a more effective way to build layers of color and value. And with the artist-grade pencils I was using in class, it was entirely possible. What a light bulb moment! All of this came back to me as I struggled to use the Prismalos, and by the time I finished that sketch of the pears, I had to take the next step immediately: Make a comparison sketch, this time with Supracolors. Conclusion: Even though Prismalos and Supracolors look and act the same when making small swatches, completing a sketch tells the full story. Perhaps Prismalos contain less pigment, or the type of binder used is less amenable to multiple applications. I wish I knew more about how watercolor pencils are made; I might be able to speculate more accurately on how they are different. After these sketches, though, I’d have to say that although Prismalos are of high quality, they are not artist grade. I think one reason why this insight struck me is that, in recent years, I’ve gotten accustomed to using artist-grade watercolor pencils, and I don’t generally explore lower-quality ones. 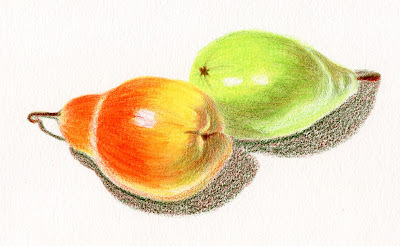 My early experiences with low-quality watercolor pencils led me to believe, for years, that all watercolor pencils behaved in a certain way which required me to use them in a certain way, and I didn’t know enough (until Suzanne’s class) to try using higher-quality pencils differently – even though I had switched to artist grade long before I began studying with her. Pretty, but probably not artist grade. Beyond this personal insight (and far beyond this product review), the moral of this story is advice I’ve often heard: When learning a new medium, always use the highest quality materials you can afford – even if they seem “better than you need” at the time. I agree with Liz completely. When you use low-quality products and bad paper (or good paper that’s inappropriate for the chosen medium), you are likely to get disappointing results – but those results are not the worst part. The worst part is that you won’t know whether the results are due to not using the materials appropriately or because those inferior materials will never give you better results even if you knew how to use them. In my case, even when I started using higher-quality pencils, I used them in the same way that the low-quality pencils had “taught” me to use them – not realizing how much more they can do and with better results when used appropriately. If you stayed with me for this whole geeky ride, thank you! And if you didn’t, but you read only the story’s moral, my job here is done.